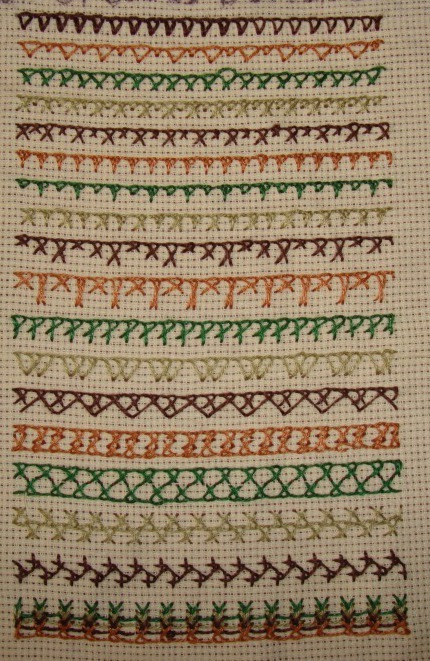 Today I completed the crossed buttonhole stitch sampler of the TAST 2012 challenge by SharonB. 9. I worked a row of herringbone between two rows of crossed buttonhole stitches. 10. first row is a combination of this stitch with up and down buttonhole stitch. Three straight stitches are tied with crossed buttonhole stitches. 11. Upright cross stitches are worked over the crossed buttonhole stitches. Crossed buttonhole stitch is combined with chain stitch. 12.Laced a perle cotton thread through the crosses. 13. twisted chain stitches are worked over the crosses and pink beads are added in between the crosses. 14. the three straight stitches worked below the crosses are embellished with pink glass beads. I enjoyed working on this sampler. Still working on some variations of crossed buttonhole stitch from TAST challenge. I tried slanting the cross stitch, but the row looks like crossed chain stitch. This row is inspired from this blog. Two rows crossed buttonhole stitch variation facing each other. Alternating the crossed buttonhole with normal buttonhole, the row is worked in zigzag pattern. Detached chain stitches are combined crossed buttonhole stitch. The complete crossed buttonhole stitch sampler which was worked during the earlier TAST challenge. 2. the first row I worked double cross stitches with long tail below the crossed buttonhole stitches. Detached chain stitches are worked over the crossed buttonhole stitches. I tried working the alternate crosses in V- shape[ not very successfully!] and three detached chains are worked inside them. Fly stitches are worked over the crosses in this row. I tried working a pattern which goes up and down. Three crosses together and one buttonhole stitch in between them. Will post some more variations tomorrow. This week’s stitch of the TAST 2012 stitch challenge by SharonB is crossed buttonhole stitch. This stitch was part of the earlier TAST challenge. I had worked a stitch sampler, when it was rerun on stitchin fingers. But had not posted the sampler on my blog or flickr. I started with closed buttonhole stitch and a variation. First row crossed buttonhole stitch, acombination of closed buttonhole stitch and crossed buttonhole stitch, long and short version of crossed buttonhole stitch. In these rows, I tried crossing three buttonhole stitches instead of two and the last row of this stitch with varying crosses. A narrow and broad version of crosses. Another three variations of this stitch. Two versions of crossed buttonhole stitches facing each other. The two rows of crossed buttonhole stitch face away from each other. This can be a zigzag version of crossed buttonhole stitch or upright crossed buttonhole stitch. Four rows of crossed buttonhole stitch. With this row this sampler is complete.